We are excited to be performing with Darbazi, a Toronto-based Georgian choir. Please join us on Saturday, March 4 at 8pm at The Church of St. Mary Magdalene. See event details. Due to illness, Schola Magdalena has withdrawn from this special concert in support of sponsoring a refugee family. This canon by Roland de Lassus (also known as Orlando di Lasso) was originally written in 1576, but Schola Magdalena has updated it and played with the canon to create an ethereal effect in the divine acoustic of St. Mary Magdalene’s Church, Toronto. Our current programme is, “In Praise of Holier Women.” We gave this concert for the first time in Kingston at the end of May 2015, and will repeat it in Toronto on June 12, 2015, and in Oakville in January 2016. 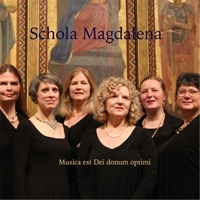 In this programme, Schola Magdalena honours seven holy women of the church: the Blessed Virgin Mary, St Hildegard of Bingen, St Marguerite Bourgeoys, Julian of Norwich, St Bridget of Sweden, St Cecilia, and Florence Nightingale. The first woman saint we honour, above all others, is Mary, the Mother of God, whose acceptance of God’s call to her set in motion the history of salvation through Jesus Christ. St Hildegard of Bingen was an abbess, mystic, theologian, scientist, artist, prophet and spiritual advisor, and one of the greatest female religious figures of history. In her autobiography, she describes visions she experienced at the age of three, which she kept hidden. A turning point in her life came at the age of 43, when she felt God instructing her to reveal her visions publicly. Since women were forbidden from writing or preaching, she was reluctant, but with the encouragement of a supportive bishop, Hildegard began to record her visions in words, music and paintings. Quite surprisingly the church authorities reacted positively, and she received papal authority to speak and write about what she had experienced. Her writings on theology and medicine are remarkably modern. Her expertise as a natural scientist and therapist are highly regarded today. Emperors, kings, princes, popes and clergy sought her counsel on spiritual and worldly matters. A poet and a musician, Hildegard composed 77 pieces of liturgical music and a musical play. St Bridget is the most celebrated saint of Sweden. An aristocrat who married and had children, she worked for a time as a lady-in-waiting for the Queen of Sweden, and was well-known for her charitable works. After her husband’s death in 1344, Bridget entered the religious life and devoted herself to caring for the sick and poor. She founded the Bridgettine order of nuns and monks; work her daughter carried on after her death. St Cecilia is perhaps best known for being the patron saint of musicians. 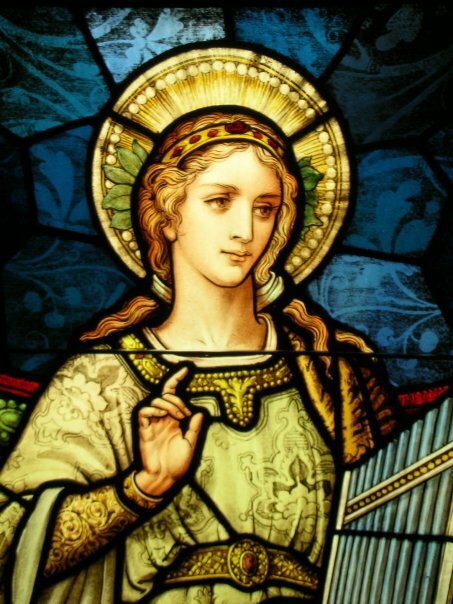 From the Standing Commission on Liturgy and Music of the Episcopal Church, we learn that according to fifth century sources, Cecilia was a woman of noble birth and extreme devotion, whose witness resulted in the conversion of her new husband and his brother. Because of this, the brothers were martyred, and while Cecilia was burying them, she too was arrested. During several days of failed attempts to put her to death, she is remembered for the passion with which she sang praises to God. The date of her martyrdom is generally thought to be 230 during the Roman persecution of Christians under Alexander Severus. Since the fourteenth century Cecilia is often shown playing the organ, a theme picked up by Raphael in a famous 1516 altarpiece. Her story has inspired centuries of artistic representations, and composers such as Handel, Purcell, Howells, and Britten have written choral works in her honor. We honour the Blessed Virgin Mary with an excerpt from Guillaume Machaut’s Messe de Notre Dame (Mass of Our Lady), the oldest complete setting of the Mass by a single composer for four voices. It is our great privilege to sing this ancient masterpiece, transposed for us by York University student, Joe Amato. Also included is music written by two of the saints we honour, Hildegard and Bridget. 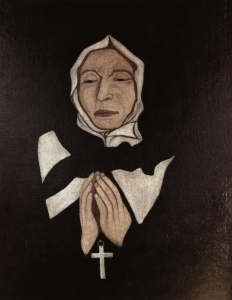 Sacrae Familiae, sung in honour of St Marguerite Bourgeoys, is a sequence hymn from the Ursuline monastery in Quebec, and is the earliest known polyphonic work written in Canada. You will also hear two modern compositions: Stephanie Martin’s Of the Glorious City, a setting of a text written by Julian of Norwich, and Ubi Caritas, which was written specifically for Schola Magdalena by a young composer, Emily Walker (born 1991). Our spring concert, “In Praise of Holier Women,” honours the Virgin Mary, St. Hildegard of Bingen, St. Marguerite Bourgeoys, Julian of Norwich, St. Bridget of Sweden, St. Cecilia and Florence Nightingale. The program will feature Gregorian Chant, Hildegard of Bingen, medieval polyphony, Machaut, early Canadian monastic music, as well as new works by Stephanie Martin and Emily Walker. Marguerite Bourgeoys was a teacher, the founder of the Congrégation de Notre-Dame de Montréal, and often considered a founder of Montreal itself. She is an important figure in Canadian history. The life that she took as a model for her own was that of Mary, mother of Jesus, and the aspect of Mary’s life that she most strongly wished to emulate was what she called Mary’s vie voyagère. This was a journeying life, a life working alongside the Apostles and other disciples in the early Church and going to where she was needed. The most obvious way in which Bourgeoys led a vie voyagère was in her travels. She was born in the city of Troyes, in France; she died in Montreal, or Ville-Marie as it was also called, in Canada. The journey from Troyes to Montreal over land to the coast, then overseas from Europe to North America, then by river from Quebec City, was difficult in the 17th century: the oceanic stage alone usually took between two and three months. Bourgeoys made this trip not just once, but seven times. She first arrived at Montreal in 1653. There had been people living at the site for thousands of years, and there had been a substantial settlement there for centuries: it was inhabitants of the town of Hochelaga who had greeted Jacques Cartier in 1530s. But for Bourgeoys, the real start to Montreal was the founding of a permanent French settlement in 1642. At her arrival 11 years later, this French settlement was in a precarious situation. Its population was only about 50 people, and they were in danger from disease, the withdrawal of support from France, and attacks by the Iroquois. A main reason why Bourgeoys undertook her voyage was to set up a school. There were not enough children for a school when she first arrived, so she tutored some children and women individually. When she was ready to open the first school in 1658, the building that she was given was a stone stable. With the help of her pupils, Bourgeoys cleaned it up – removing traces of the cattle that had occupied the ground floor and the doves that had made their home upstairs. She journeyed back to France that year in order to recruit more women to help with her school. A conversation that she had with the father of one of the recruits shows us something of the conditions in the Montreal school. The father asked Bourgeoys, “how will you live in that country?” She showed him a contract, and he said “alright, here is what you have for lodging, but for the rest, what will you do?” Bourgeoys answered that they would work, and that she promised her companions bread and pottage. This statement, she said, pulled tears from the father’s eyes, because he loved his daughter very much. He must have been persuaded by Bourgeoys nevertheless, for he did permit his daughter to go to Canada. Curriculum in the school probably included reading and writing, religious instruction, and also domestic skills like sewing so that the girls could support themselves and their families. By 1663, the school had about 30 pupils, and the school house was serving not only as a place of instruction, but also as a place where marriage contracts were signed. These marriage contracts were becoming more frequent, as the first filles du roi began to arrive, and they too were cared for by Marguerite Bourgeoys. The filles du roi, literally “daughters of the king”, were young women from France sent with a dowry to Canada so that they would marry and increase the settler population. Before their arrival, there were about ten men for every French woman in Montreal. Official French policy encouraged intermarriage with Native women, but little to no intermarriage was taking place. In the Native societies near Montreal, men married into women’s families and then took on role of provider; children remained connected to their mothers’ lineage, and did not expect their fathers to be authorities – male authorities in their families were more likely to be brothers of their mother. This is very different from 17th-century French society, where, at least in theory, women married into men’s families and fathers took on role of authority; children remained more closely connected to their fathers’ lineage, and wives had few legal rights compared with French men or Native women. Native women generally were not willing to enter into this kind of arrangement and so marriage rates remained low. After the arrival of the filles du roi, however, marriage became more frequent and birth rates rose drastically: over the next 20 years, the French population of Montreal tripled. Bourgeoys also founded and defended the religious order of the Congrégation de Notre-Dame de Montréal, an uncloistered order for women. Most religious communities for women at the time were cloistered, with members prohibited from leaving convents and able to admit outsiders only into designated areas. Bourgeoys argued against such cloistering by saying that their teacher, the Virgin Mary, had never been cloistered. One social benefit of being uncloistered was that it allowed members to instruct children outside of their own buildings. Another social benefit was for women seeking to enter the community. The financial security of cloistered communities depended on endowments and dowries, thereby excluding most poor women. In an uncloistered community, by contrast, members could engage in more of their own economic work, thus opening the community to women from a wider range of social backgrounds. Civic authorities were very grateful to an organization that was self-supporting and willing to offer free education. The letters patent from Louis XIV giving official recognition to the Congregation carefully point out that Bourgeoys had instructed the young and engaged in works of charity without costing the country anything. Not all of Marguerite Bourgeoys’ efforts were easy or successful. Consider her attempts to convert the “sauvages”, as she and other French-speakers called the First Nations. Say what you will about the purity of their motivations, and I see no reason to doubt the sincerity of their desires to save the souls of people who were not Christian, but many of the religious missionaries of the 17th century exacerbated harmful processes underway in native societies. Bourgeoys probably would have felt that she had at least some success in her mission to the Natives. She and her companions instructed several Native girls, and two Native women eventually joined their community. But some of her actions are hard to understand. She took an Iroquois baby into her care, and although most biographies that mention the event call it an adoption, to me it looked, at first, more like a kidnapping. Bourgeoys said that the mother had somewhat neglected her baby and so she took the nine-month-old infant. When the baby’s father came looking for his daughter, he was not told where she was and he was sent away without her. I looked for more information. The record of her baptism, which is an unusually long entry in the parish register, says that the mother, returning from the hunt with others from her village, gave her daughter willingly to the governor de Maisonneuve for him to raise like his own daughter. Then, a few days later, with the mother promising never to ask for her back, de Maisonneuve had girl baptised and was himself the godfather. I’m still not certain what to make of this case, but it is possible that the baby’s mother gave the child to de Maisonneuve, who gave her to Bourgeoys; the father, perhaps not consenting to the arrangement, went to look for the child with de Maisonneuve, unaware that she had been passed along to the women of the Congregation. In any case, it would seem that some dishonesty was involved in placing the child. Whatever the real arrangement for her care, she did not live long. The record of the child’s burial says that she died at age five years, ten months, and was buried in Notre-Dame in Montreal. We know from demographic historians that death rates for children were very high, and so her fate in this respect was, tragically, not uncommon. Another area in which Bourgeoys struggled was in her desire to build a stone chapel, Notre-Dame-de- Bon-Secours – our Lady of Good Help. Governor de Maisonneuve made a land grant for the project, sent men to fell trees, and even helped to drag these trees to the site of construction himself. Bourgeoys helped in her own way with the construction too, making a contract that for each day the men spent gathering stones, she would do for them services of mending and sewing. But work was interrupted for almost two decades, because other members of the Congregation thought that their resources should not be spent on this project, but rather on building better quarters for themselves and their work. Bourgeoys assented to the wishes of her companions. When it was finally complete in 1675, Notre-Dame-de-Bon- Secours became the first stone church on the Island of Montreal. Of Marguerite Bourgeoys’ involvement with music, I could only find one anecdote. In 1662, a new novice was about to enter another religious order in Montreal – that of the Hospitalières. The hospital sisters in attendance at the ceremony had no voice for singing, so Marguerite Bourgeoys and two of her companions from the Congregation sang at the ceremony instead. The records, alas, do not tell us what they sang, nor how well. When Marguerite Bourgeoys died on 12 January, 1700, she left an impressive legacy: the order of the Congrégation de Notre Dame, which still exists today; the chapel of Bon Secours, which still stands, though rebuilt, on the original site; the Maison Saint-Gabriel, historic house on an estate run by the Congregation in Bourgeoys’ time; and, of course, the many intellectual descendants of her students. I suppose that tonight we are going to become musical descendants of Marguerite Bourgeoys, and with the singing of this Compline service, her vie voyagère will extend even unto us. Bourgeoys, Marguerite. Marguerite Bourgeoys, Textes choisis et présentés par Hélène Bernier. Montréal et Paris: Fides, 1958. Registre de Notre-Dame de Montréal, 1642-1681. Bernier, Hélène. “Bourgeoys, Marguerite, dite du Saint-Sacrement,” in Dictionary of Canadian Biography, vol. 1. Toronto / Québec: University of Toronto/Université Laval, 2003–. Greer, Allan. The People of New France. Toronto: University of Toronto Press, 1997. Dechêne, Louise. Le Peuple, l’État et la Guerre au Canada sous le Régime français. Québec : Boréal, 2008. Noel, Jan. Along a River: The First French-Canadian Women. Toronto: University of Toronto Press, 2013. Simpson, Patricia. Marguerite Bourgeoys and Montreal, 1640-1665. Montreal and Kingston: McGill- Queen’s University Press, 1997. Simpson, Patricia. Marguerite Bourgeoys and the Congregation of Notre Dame, 1665-1700. Montreal: McGill-Queen’s University Press, 2005. Viau, Roland. “L’archipel du négoce, 1650-1701” in Histoire de Montréal et de sa région, ed. Dany Fougères. Québec : Les Presses de l’Université Laval, 2012, pp. 105-163. Schola Magdalena will present a series of Compline services in 2014 and 2015. The first of these will take place in November on the eve of the Feast of St. Cecilia, patroness of music. Compline is the final monastic service or office of the evening. Schola will enhance this service of quiet contemplation and prayer with beautiful motets and plainchant in the candlelit sanctuary of the historic Church of Saint Mary Magdalene, 477 Manning Avenue, Toronto. Friday, November 21, 2014. 8:15 pm.